There are cases when, for different reasons, you might need to disable or enable the Windows Vista's firewall. In this short tutorial we will show you how this can be done. Just follow the steps described below and you will be done in no time. 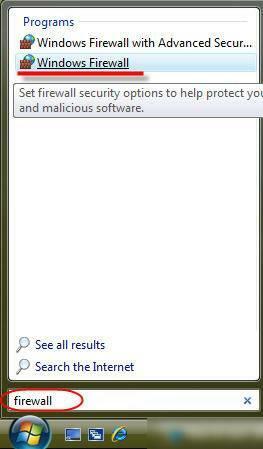 The easiest way to find the Windows Vista Firewall is to type the word firewall in the Start Menu search box. You will see these two results: Windows Firewall with Advanced Security and Windows Firewall. Click on the second result and the main window of Windows Firewall will open. Now, click on the Turn Windows Firewall on or off link, from the left, or click the Change settings link, from the right. Both links will open the Windows Firewall Settings window. By default, the On (recommended) setting will be enabled. 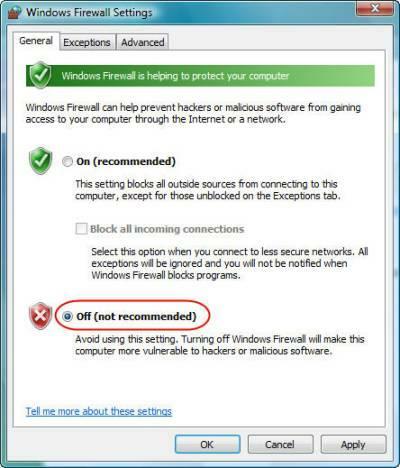 Select Off (not recommended) to turn off Windows Firewall and then click on OK. This is how the main window of Windows Firewall will look like after you have turned off the firewall. 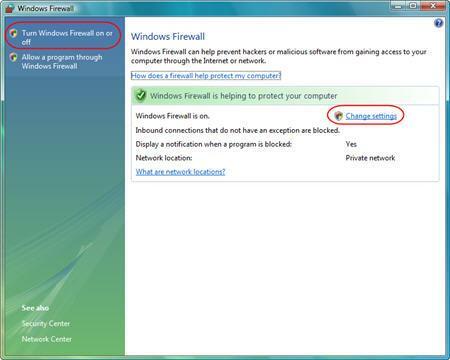 If you want to revert to the old settings and enable Windows Firewall, click on the Update settings now link. I have McAfee Security Centre and am confused as to whether I turn off Windows Firewall? If it's turned off I keep getting your computer is not secure, check your security settings. 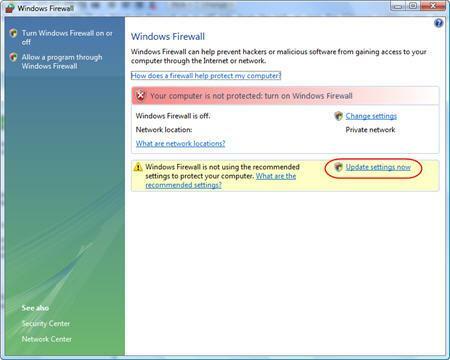 If you have another firewall, it is OK to disable the Windows Firewall. You don't need them both. I have Microsoft Live Onecare and hopefully after turning off firewall my computer is protected . It was knocked out by trying to use the Vista firewall at the same time but it does actually recommend you disabling any.Live Onecare works fine now. I have tried everything to turn WIndows firewall back on - I had tried to install Live one care and it did not install correctly so I went back in to turn Windows Firewall back on - and it wont do it - I have tried to restore defaults to turn back on but nothing works?? Any help??? sky firewall is blocking certain web pages how do i switch that one off ? I have F-secure and can not turn Windows firewall off. Vista is shyte. i can not turn on the firewall. it said that "for your security,some settings are controlled by group policy." how can i turn it on? any help? Cooper: For some curious reason, you cannot get out right now. I have been getting this since i got a router. I also tried what the answer said but still got no results. I want to turn off my firewall but when I do, the firewall settings says "for your security, some security are controlled by group policy." how can I turn if off when it doesnt even allow me to click on or off?